The University of Redlands celebrated its international students during International Education Week November 12–16. Here is one of their stories. When Johnston Center for Integrative Studies student Maxine Mchunguzi ’20 was researching universities to attend, she was looking for places that had similar weather patterns to her hometown of Johannesburg, South Africa. Then she found the University of Redlands. 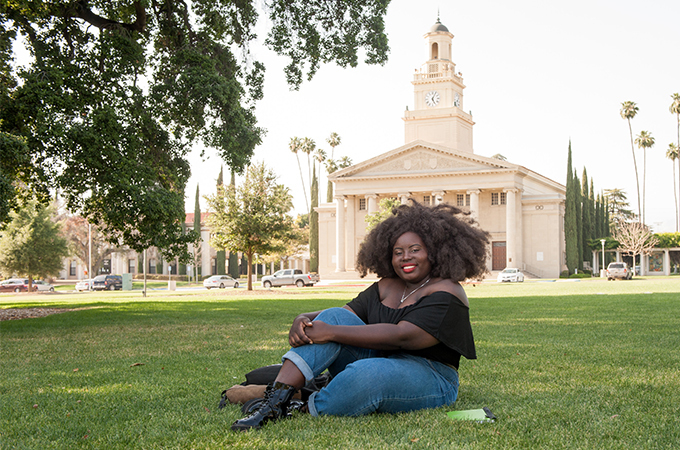 Originally a media and visual culture studies major, Mchunguzi decided to become a Johnston student after taking a business marketing class during her first year. Her current emphasis is media, marketing, and communications—a curriculum she designed that combines film and other media courses with marketing and ethnic studies. Outside the classroom, Mchunguzi spends her time as a community assistant in North Hall, a dorm that houses internationally minded students. Residents regularly host language tutorials, meetings of internationally themed clubs and organizations, film screenings, and cooking classes. For more information about international student life at the University of Redlands, visit the web pages of the Office of International Students and Scholars. For information about study abroad opportunities at the U of R, see the Office of Study Abroad.